The first-ever international loan exhibition of Botticelli's works in the U.S.
Sandro Botticelli's magical, lyrical "Primavera" (c. 1478) and elegant "Birth of Venus" (c. 1484) have made him one of the world's most beloved Renaissance artists. Millions of visitors crowd into the Uffizi Gallery in Florence every year to see them and his other paintings. Various European museums can boast of their Botticelli holdings, too, though none so great as those in Italy. In the U.S., only a small number of museums own a few works by him. That is why "Botticelli and the Search for the Divine: Florentine Painting Between the Medici and the Bonfires of the Vanities" at the Muscarelle Museum of Art here is so special. It may be small, but it is the first-ever international loan exhibition of his works in this country. Most paintings by Botticelli (c. 1445-1510) are simply too large, too fragile or too popular to be lent. The little-known Muscarelle pulled off "Botticelli and the Search for the Divine" with loans from the Uffizi, the Pitti Palace and other Italian institutions largely because of John T. Spike, chief curator. His respected scholarship and relationships in Italy had also allowed the Muscarelle to organize exhibitions of drawings by Michelangelo (2010), paintings by Caravaggio (2014) and drawings by Leonardo da Vinci (2015). This exhibit is powerful because, with just 14 Botticelli works (some with assistants, but always—Mr. Spike said—with Botticelli's supervision) and more than a dozen by predecessors and followers, it sheds light on all three phases of Botticelli's career: his formation, his peak creativity and his retro period during his final decade, after Girolamo Savonarola, the fire-and-brimstone friar, had led the burning of artworks that likely included many of the nudes and paganist works Botticelli had been creating. 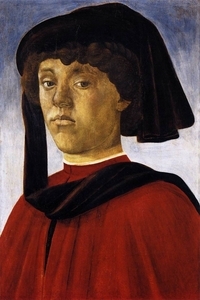 Botticelli learned painting mainly from Filippo Lippi. Five Lippi works here attest to his genius, particularly the extraordinary "Madonna and Child" (c. 1466-69). It portrays a finely dressed Mary ensconced in a marble structure, tenderly holding the baby Jesus cheek-to-cheek. The work is his alone, but in "The Annunciation With St. Julian the Martyr" (c. 1465), by Lippi and workshop, some see Botticelli's hand in the delicate modeling of the angel's face. When Botticelli went off on this own, he took everything he had learned to greater heights. Three paintings show his evolution. He created "Madonna and Child With an Angel" (c. 1465) while with Lippi: The composition is much like one of his teacher's works, though Botticelli warmed the relationship between mother and child. By about 1467, his beautiful "Madonna of the Loggia" feels more poignant. Mary and Jesus have finer features and they hug in more intense intimacy. 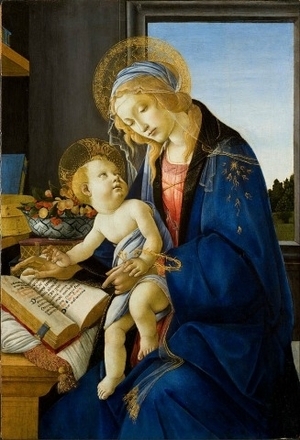 But that painting is nothing compared with his exquisite "Madonna of the Book" (c. 1478-80) across the gallery. In it, Jesus sits on Mary's lap looking up to her serene face; they are locked not in embrace but, with their arms and hands aligned, in harmony and in acceptance of his future as the Redeemer. His knowing eyes show empathy for the pain she would have to endure. Botticelli used the richest lapis lazuli for Mary's mantle and gold for decorative highlights, and he rendered Mary's gossamer veil flawlessly. Behind the pair, the glow through a window is ethereal—perhaps evidence for the speculation by some that the work represents Botticelli's view of heaven. Back on earth, Botticelli was painting portraits, like "Portrait of a Young Man Wearing a Mazzocchio" (1470s), and mythical subjects, like "Judgment of Paris" (1485-88), which was executed mainly by his assistants. His well-known talent for creating alluring bodies is on display in "Venus" (c. 1484-90), naked but for a diaphanous garment covering her upper body and solitary against a black background, in a pose similar to "Birth of Venus." (Many authorities attribute this work to assistants, but Mr. Spike recognizes Botticelli's hand in parts of it.) A surprise awaits those who step back several feet to take in "Crucifix Crucified" (c. 1488) along with "Venus." Botticelli's body of Christ is equally beautiful, unmarked by trauma. The final gallery here is filled with his revelatory late works. Mostly ignored in the past, they display a restrained, perhaps austere, style, but not a diminution in talent. 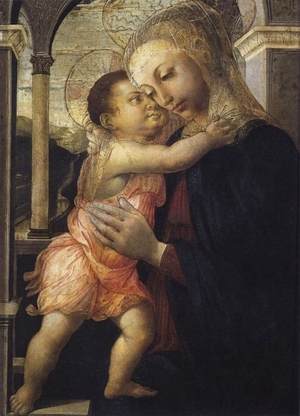 Chastened by Savonarola, Botticelli painted "Madonna With the Child and the Young St. John" (c. 1505) in a flatter manner, but the grace remains. In "Madonna and Child Enthroned With Sts. Sebastian, Lawrence, John the Evangelist and Roch" (1499), the static figures show little emotion, but the composition and execution are stellar. "Botticelli and the Search for the Divine" is too small to satisfy everyone (it will be slightly larger at the Museum of Fine Arts, Boston, its only other stop, opening April 15), but it is a splendid display of the span and depth of Botticelli's gifts—the best short of a visit to Italy.